Hi, my name is Will and I'm a cameraholic. But more seriously, I love photography and taking photos however packing (and carrying) camera gear can be a real pain in the neck (or back). Decision about what to take, how to pack it, what to pack it in tend to drive me mad but I thought I'd write a bit about my decision process and some cool gear incase it helps you out. Where are you going and what will you be shooting? What luggage restrictions will you have? The Mark II was an upgrade from the original 7D because it sounded amazing for wildlife (and very good in general) and I thought I'd splurge for the trip. I had used the 7D + Canon 100-400 for wildlife in Southern Africa and it had performed quite well but I had a few frustrations and as always, wanted more length, so that's why I also added the Tamron 150-600 to the list. It had been getting great reviews and has some extra length, better image stabilisation and seems to have very good image quality for it's size and weight. The other two lenses are the best way of covering the wide and standard range from the kit I already had, plus the both have the same filter size which is always a plus. I also have a Tamron 17-50 f/2.8 which I almost brought because it is much smaller and lighter than the Canon when you don't need the stabilisation but I decided against it because of the filter size. I also debated a lot about bringing a flash and a macro and eventually decided against it. The Sony is a waterproof camera that I've recently started playing around with. Not high end but for taking snaps in heavy rain, under water or as a small camera around town it works pretty well. Plus we got it cheap. This took quite a lot of searching as the camera plus the tamron wildlife lens is a very long set-up and my old LowenPro fastback 250 could hold it. 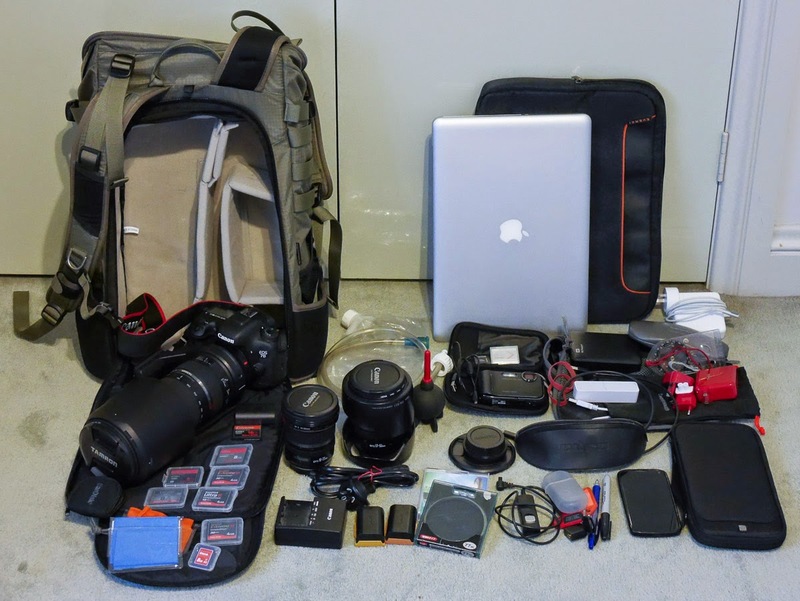 Basically I was looking for a bag that had a similar concept, some space for camera stuff and space for other stuff and a laptop and was airline compatible. In the end I found a brand called F-Stop and after much debate settled on the Loka with a large shallow ICU (you have to buy the camera padded section separately). This was tricky because I had to mail order the bag and couldn't try it out with my gear or my back. Turned out pretty well and the harness is fantastic, I've heard many people say they are best photo packs for hiking in the world and I think they might be right. I have also picked up a laptop sleeve with enough space to hold the power pack and a few other things in a side pocket. This also fits neatly in the Loka bag behind the ICU (without stuff in the side pocket) and I picked up a medium packing cell from Kathmandu to keep bits and pieces together in the top of the pack. Loka with large shallow ICU configuration to allow the camera to be packed on different lenses. Everyone's carry-on luggage was also weight by Qatar Airways when leaving Johannesburg prior to check-in and even without my laptop my carry-on was about 9 kg. The staff member asked what was in there, I said a camera so they said I should take it out. Since the wildlife lens was on the camera it dropped to around 5 kg which they said was fine and if I was stopped (because they weight it again when we actually checked in) that I should tell them it is camera gear. I might be more upfront about the camera next time. We had three flights between Dubrovnik and Trondheim. My bag with laptop just fitted in the overhead locker on the Croatian Airlines flight (Bombardier Dash 8), easily fitted without laptop. The second hop from Zurich was on a Bombardier CRJ900 which had similar size overhead lockers to the Dash 8 (maybe slightly bigger but didn't try my bag with the laptop). On this flight they asked to check my bag at the gate for size reasons but when I said it was photo gear they let me on with a warning that it might not fit however it was not an issue. I think the last hop to Trondheim was on the exact same plane and again, not an issue. We have had to check-in to 8 different flights in major and minor cities and these are the only two that have weighted our carry-on bags. Other airlines Etihad, Air Canada, Norwegian Airlines, Berlin Airlines, South African Airlines (from a very small rural airport). Most airlines seem to have a policy that you can not put a camera or laptop in your checked luggage and they lithium batteries in general are can not be checked either. So I think there are grounds to argue that you should be allowed to carry the extra weight on, within reason, if you get pulled up. This is a travel blog by Jackie Knight and Will Hore-Lacy to keep in touch with friends, show off some amazing places around the world and try and pass along some tips. If you want to know more check out our welcome post. Many of Will's photos are available for sale on Redbubble. © Jackie Knight & Will Hore-Lacy. Watermark theme. Powered by Blogger.